Passengers are advised to check with Ryanair for bookings made after the date. inquiry into a planned runway extension would be further delayed. Ryanair has been operating from George Best Belfast City Airport since 2007. – Bristol, the East Midlands, Prestwick, Liverpool and London. The airline flies about 800,000 passengers a year from the airport. more than three years after we opened the base at Belfast City”. us with the runway infrastructure and low-cost facilities we need”. 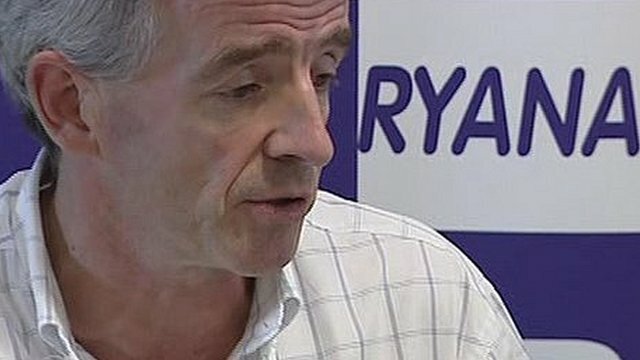 aircraft to another European airport, with the loss of 50 Ryanair jobs. It said that all staff will be offered relocation elsewhere in the UK or Europe. had provided five successful routes from Belfast City Airport”. to fill the void,” she said. Ryanair is Europe’s largest low-cost airline. Its operations from Derry City airport are not affected by Tuesday’s decision. Belfast City Airport has wanted to build a runway extension for some time. of George Best Belfast City Airport, at least temporarily. of the BCAW Steering Group. make their routes profitable,” said Dr Fawcett. as the proposed runway extension. strategy for the region’s airports. of Belfast International Airport,” said Dr Fawcett. the airport to greatly expand its operations. which was commissioned by the Planning Service. extended runway, possibly with some adaptations to ground infrastructure. weren’t getting enough sleep because of aircraft noise. 028 9020 0811 or 0771 943 5662. – data attributed to CAA. withdrawals and influencing a public inquiry. Posted: Wednesday, September 1st, 2010. Filed in News about Airports.